No, hearing aids can not make your hearing worse. No, hearing aids can not make your hearing worse. Hearing can change at any time whether you wear hearing aids or not. However, research has shown that unaided hearing loss has greater impact on one’s health. Untreated hearing loss can lead to lack of cognitive input, impairs memory, fatigue, stress, irritability, and affecting job performance. It is important to realize that we hear with our brain. Our outer ear, middle ear and inner ear system are pathways that bring sound to our brain for interpretation. Hearing devices make sounds easier to hear, but it is important to have realistic expectations. Successful use of hearing devices rely on realistic expectations. Some people are able to adapt easily to hearing aids while others take longer. Your audiologist will work closely with you on this to guide you and help you during this process. It is important to wear your hearing device daily to get accustomed to new sounds and retrain your brain to hear sounds around you. Hearing with both ears gives us advantages such as being able to localize to sounds. It helps us determine the direction where the sound is coming from. With two ears, it helps us hear better in group situations. It allows us to hear and perceive sounds clearer. However, our hearing can change in one ear or both ears. If the hearing is good in one ear and the other has a decrease that would benefit from amplification, then it is important to balance sounds by amplifying the weaker ear. Others may have a hearing impairment in both ears, but one side may have poor word recognition ability making it unaidable with traditional hearing aids. Other options such as a Cros device and hearing aid use may have to be explored or recommended based on your hearing test results. It is imperative to check with your audiologist if you are a good candidate for one or two hearing aids. 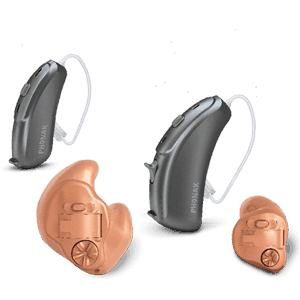 Learn more about CROS hearing aids.